Gaijin Entertainment, the folks who brought you War Thunder, have announced their latest project. Enlisted will be a large-scale, squad-based multiplayer FPS, and it will explore the most important battles in World War II. Have a hankering for the classics? Here are the best WW2 games on PC. 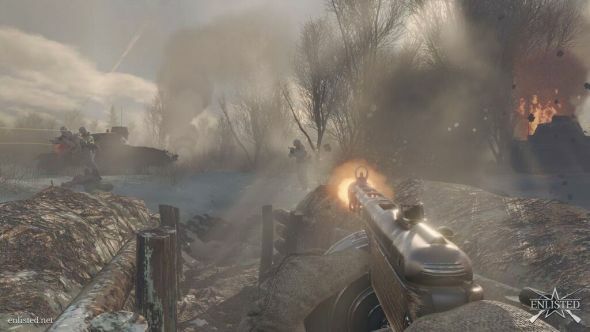 Developed by Latvian newcomers Darkflow Software and published by Gaijin, Enlisted will initially offer two campaigns, each focusing on a different front in the latter stages of WW2: the Battle of Moscow and the Battle of Normandy. It will be built in Gaijin’s proprietary Dagor Engine, and early screens look rather impressive. What’s unique about the game, though, is Darkflow’s promise to consult the fans for its future development. You can pledge to Enlisted by buying either or both of the first two campaigns, as well as weapon packs which unlock guns at different tiers – hopefully this doesn’t mean it’s pay-to-win. The biggest pack, available for $50 USD, includes both campaigns, three guns, and grants early access to the game. Perhaps this will take the form of guaranteed access to Enlisted’s closed beta, which is planned for the second half of next year. Many developers promise a community-centric approach to making games, but this is bigger talk of that kind than we usually tend to hear.